Follow the penguins on the next great adventure in the Fantasy Mosaics series. Penguin Penny has discovered a treasure map hidden in the attic of the penguin house! Now the penguin family is off on a new exciting adventure to find the treasure! 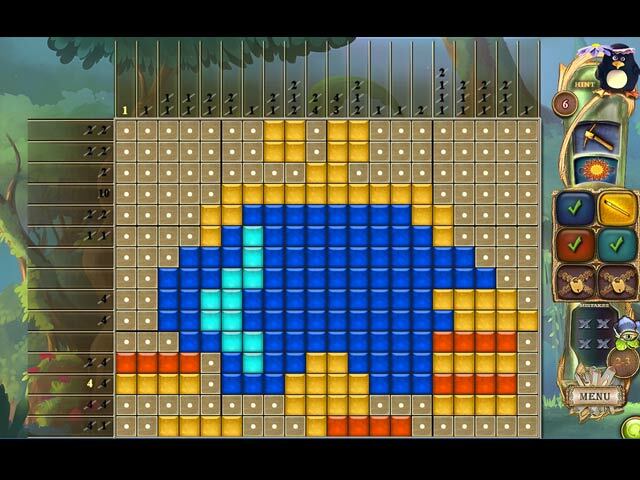 Join the penguins and help them solve a new collection of colorful mosaic puzzles and unlock secret colors as you play! 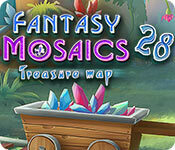 Fantasy Mosaics 28: Treasure Map is rated 4.1 out of 5 by 13. Rated 5 out of 5 by zandu2 from Thanks for the good time... I must admit that there is some beautiful art work done on these mosaic. This mosaic is well done and I am truly enjoying it... I just wished that the music wasn't on a loop. Rated 5 out of 5 by verimeri from best one of all I loved the new Fantasy Mosaics. The puzzles were a higher level of difficulty. Sometimes in the older versions it seemed like they were just too easy. Also the color choices were a very nice addition. I did not find one puzzle that I simply could not solve with logic. That is the highest praise of all for a number style mosaic game. Rated 5 out of 5 by JesusFavorite from Love those Penguins! I love, love, love these...and especially since they changed them to locked colors. I, more than once, wanted to go to a different color but found I needed to fill in more spaces. I have all 28 of these games and hope they continue to release them at a frenzied pace...I will buy them. I like the fact that you can get all three stars for each puzzle without using any hints -- logic, not guessing. Thank you for these. Rated 5 out of 5 by MrsBen from YOU CAN TELL IT'S A GREAT MONDAY WHEN THE PENGUIN FAMILY POPS IN!! Still loving these Penguin games, even though this will make my 28th purchase!! The choices of tile colors make it fun, too...I noticed they'd changed one from a pyramid shape to a convex, lower tile. I like the new one better. I think the music is repetitive, but everything else is PERFECT!! Is this a record for game sequels??? I don't usually keep tabs on such things....I just know what I like!! I also thank the devs and BFG for keeping us so regally entertained! Rated 5 out of 5 by 2020moonlanding from Charming How wonderful to have a new edition so soon from the release of the 27th one. A big thank you to the developers! All the familiar features are back with a great improvement on background graphics! The colors and music are soft and calming making for a nice experience. 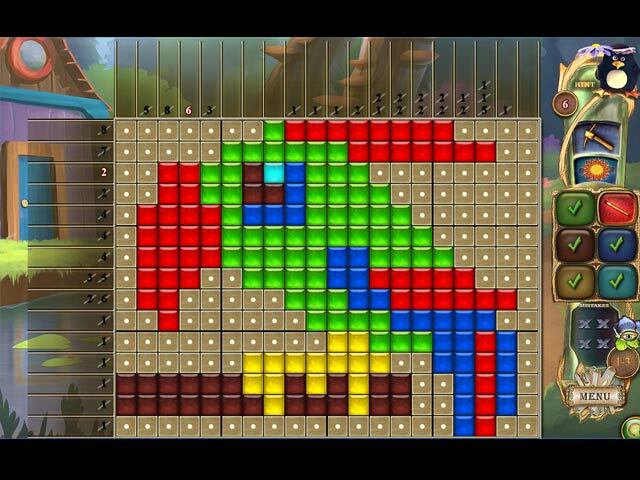 Rated 5 out of 5 by sunnyglow from PENNY PENGUIN LEADS US TO ANOTHER TREASURE TROVE OF GREAT NONOGRAM PUZZLES OVERVIEW: Open another treasure trove of great nonograms in this game! Penny Penguin has located a treasure map. Now, she has enlisted the whole Penguin family to search for the treasure by playing these puzzles! NEW FEATURES HAVE RETURNED: As with the last game in this series, you cannot switch from color-to-color for all the colors at the beginning of the game. You must play into the game to unlock some colors. This makes this game a little more difficult! You also have a choice of five (5) different styles of tiles for the game. What a wonderful Monday surprise! A BIG THANK you to BFG for offering a game in one of my favorite genres. Match Gems has upped their game with these new additions! This is another excellent 5-star game from Match Gems. GAME FACTS: • Levels: Casual and Advanced. • Colors: The game has up to six colored screens. In this game you will need to play one color until you have uncovered enough of the cells to release the next color. • You have the choice of five (5) different styles of tiles in which to play the game. • Autofill: There is auto-fill so you do not have to fill in the unused boxes. However, you can use your mouse to right click “X’s” for unused spaces. • Hints: Hints are given as you proceed and are based on the difficulty of the puzzle and how well you perform in solving the grid • Number of Levels and Puzzles: There are 100 puzzles – 20 levels with 5 puzzles per level in the game. • Aids: You have a pickax as an aid in the game • Awards: There are 3 trophies: a gold trophy for no mistakes, a silver trophy for 1 mistake, and a bronze trophy for two mistakes. If you make 3 mistakes, you must start the game over again. I highly recommend this game if you like Sudoku games or any type of mathematical puzzle. Rated 4 out of 5 by Calopsitta from Very difficult to say if i really want more of the same. Now, my father has filled the crossword puzzle at the end of his newspaper daily for at least 60 years.... it is always a crossword, but, of course, a different one each day. I feel it is the same here. The 28 games are all EXACTLY the same, with minor differences in powerups or number of colors, but, of course, you get 120 new schemes if you happen to remember the 120 from the previous games, or simply if you like it so much that you want more. The main problem with this games, for me, is the horrendously ugly garden or forest or seaside that gets filled up with equally horrendous animals, creatures and features as you progress. Other games have devised more appealing outcomes to justify your efforts in solving schemes, but that is secondary. The penguin games work excellently well, colors are bright, schemes are fun. Do you want more? buy more! The only thing one can say about each new episode, is that some are more difficult, and some are just logic based while some others are not. This one tends to be on the easy side, and not always you can solve a scheme just relying on logic. In this one, you will have to use powerups or blind guess. But after that, schemes are on the easy side. Enjoy as many penguins you like! They are not a species endangered with extinction! Rated 3 out of 5 by LogieBaby from Fantasy Mosaics perhaps should get a name change to Overkill Mosaics The initial FM game I bought was FM2 which was on 6/4/14. This means on average Match Gems has released 7 of its mosaics games annually. I have long thought this is way too much and have opined as such for a couple years. I understand some players cannot get enough of these and to its credit Match Gems is unmatched in what it does. This developer was the first to introduce multiple color grids and later on was the first to provide its fans with 6 color grids which is all well and good. My problem is getting tired of all the teddy bears, kittens and cats, birds, buildings of various sorts etc. and infinitum. I have also bought 10-12 of these griddlers so I have reached my saturation point. Why should I pay more for the very same thing?? 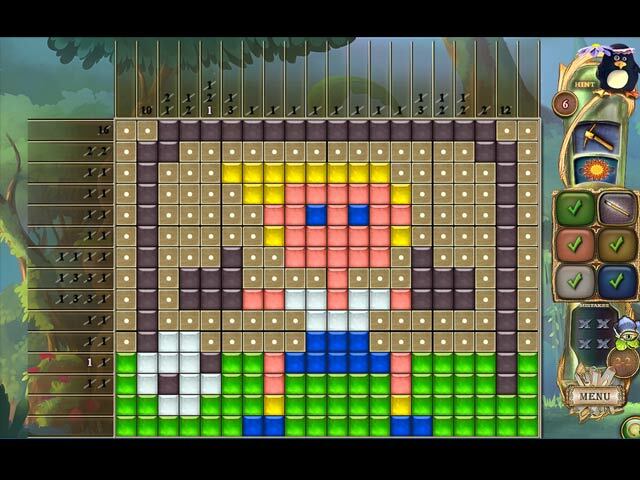 Whenever I have an urge to complete mosaic puzzles I have an abundant stack of repeatable games at my disposal. I do recommend all FM games since they are the best of its genre. If and when Match Gems adds something unique to its repertoire I will certainly consider . As matters stand now I have long ago bought my last in the constantly expanding FM series. If you cannot get enough of these, then have a blast with #28 even though you will be playing the same as #27, #26, #25 and so on.